The cat allergy test checks for cat dander IgE blood antibodies. What is a cat allergy test? A cat dander allergy test measures the cat dander IgE antibody blood levels. Why is a cat dander IgE test important? This cat dander IgE blood test can help identify an allergy to cats. This Cat Allergy Test is a blood test. This cat dander allergy test, also known as a cat allergy test, cat allergy blood test, and cat IgE test, measures the cat dander IgE antibody blood level. A cat allergy is a relatively common issue in which one is allergic to allergens produced by a cat. Like many allergens, a cat allergy can cause symptoms like runny nose and itchy eyes to more severe allergies that require immediate medical attention. In many cases, the cat allergy symptoms are caused by cat dander. Cat dander is microscopic and similar to human dandruff. Circulating through the air, cat dander can build up in household furnishings like carpets, pillows and mattresses and cause allergy symptoms in people with a cat dander allergy. 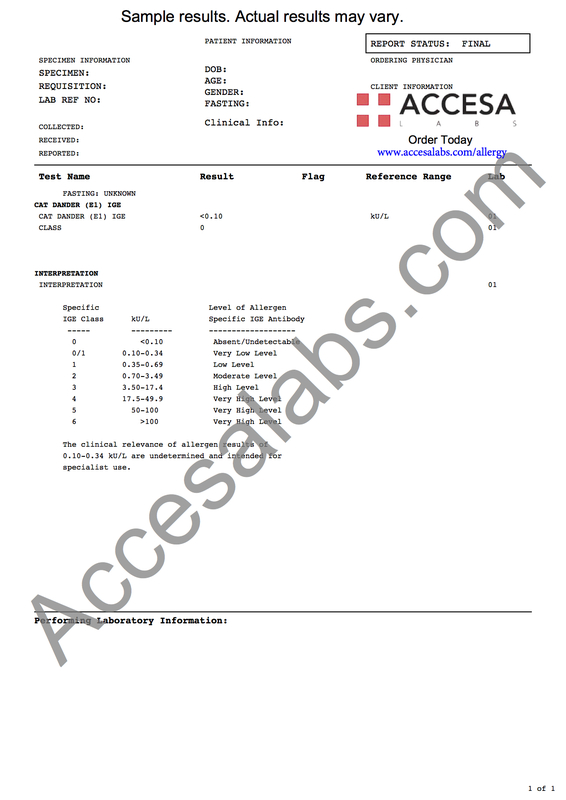 This cat dander IgE test uses the ImmunoCAP® lab methodology. IgE blood test results are reported in kU/L and can be compared against the IgE antibody reference range provided by the lab to determine the IgE allergy class to cat dander. For more general pet allergy testing, check out the cat & dog allergy test panel. This cat dander allergy blood test is less painful and has less side effects than historical allergy testing methods such as the skin prick test (SPT). In the skin prick, or scratch, test, serum containing cat dander components are injected into the skin. If you are allergic to cats, you will, unfortunately, have a mild allergic reaction and all of the symptoms that go with it. Instead, this allergy blood test can check for a cat dander allergy without causing an allergic reaction, resulting in a much more comfortable lab testing experience through a simple blood draw. There are other ways to reduce the symptoms of cat dander allergies. When possible, washing your cat regularly can help reduce the amount of dander being shed. Frequent vacuuming of rugs and carpets can help remove cat dander from the environment. Also, cleaning furniture and other home furnishings with soap and water can help remove excess cat dander from your home. Cat Allergy Test at Guaranteed Prices.